Epiphanies sometimes come in small packages. 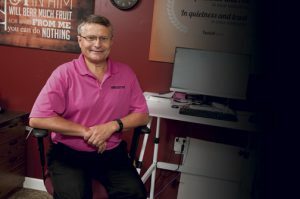 In 2012, Preferred Insurance Center, Coldwater, Ohio, became a centenarian, and Partner Dan Muhlenkamp wanted to do something to celebrate the event. Dan and his team decided to make it the Year of Giving Back—a way to say thank you to the community that had supported the agency and helped it grow. So, they instituted a program where, every time they provided a quote, the agency would donate $10 to a local charity. And then they decided that they needed a fund-raising event to bring in more money for charities. An intern at the agency was tasked with coming up with a fundraiser, and “Flamingo Flocking” emerged from that project. Here’s how a flocking fundraiser works: Flamingos appear in the yard of a client along with a sign that says, “You’ve been flocked.” For a $20 “moving-fee donation,” Preferred Insurance or charity team members would remove the flamingos and move them to a new location. Many times people would gladly let Preferred Insurance quote their insurance, so another $10 was added to the donation. It caught on. People in the community loved the idea and, by the end of the year, the agency had raised more than $20,000 for charities. And the employees started wearing pink shirts, both in the office and when they were out in the community. 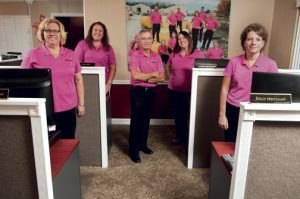 From left: Kathy Reithman, Insurance Agent/Service Specialist; Gina Hess, Office Manager; Roger Rindler, Partner; Andrea AbouJaoude, Insurance Agent/Service Specialist; Kelly Heitkamp, Insurance Agent/Service Specialist. Dan adds, “We have one especially poignant story about that. One of our clients was having a bad day. So, she came into the agency to cheer up and get a hug. Dan notes, “This fits my personality perfectly. I’m a very purpose-driven person and I’ve always viewed as one of my purposes mentoring people so they would be ready to help others. Our focus on charitable donations growing out of our business efforts reinforces that approach. I genuinely feel like we’re doing something worthwhile. At the same time, the excitement this generates allows us to have fun at work. And clients see that and hear it. “It’s all about the culture thing,” Roger quips. “We’ve developed a culture that is focused on helping people. And that message shows in the way we treat our team members, our clients, our insurance companies, and our community. It has proved efficacious in helping us grow. At the moment, personal lines generates about 75% of the agency’s revenue, with commercial lines rounding out the balance, along with very little life and health. 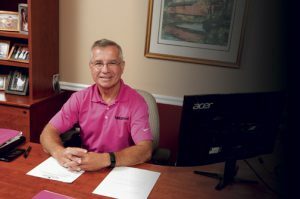 “We’re working to change that,” Dan says, “and Keystone offers expertise in so many areas, that we feel comfortable telling clients and prospects that we can provide a full complement of risk management and employee benefits services. From left: Dan Muhlenkamp; Chris Wenning, Insurance Agent; Nate Kaup, Insurance Agent; Abby Timmerman, Insurance Agent; Andy Kremer, Insurance Agent; Amanda Kremer, Insurance Agent; Stacy Lochtefeld, Marketing Assistant. Rough Notes is proud to recognize Preferred Insurance Center as our Agency of the Month. Its concern for the welfare of its clients and its community makes the agency well deserving of the accolade.